Elixir is mobile friendly bootstrap template for consultancy & legal services. An elegant HTML5 bootstrap template for consultancy agency site. 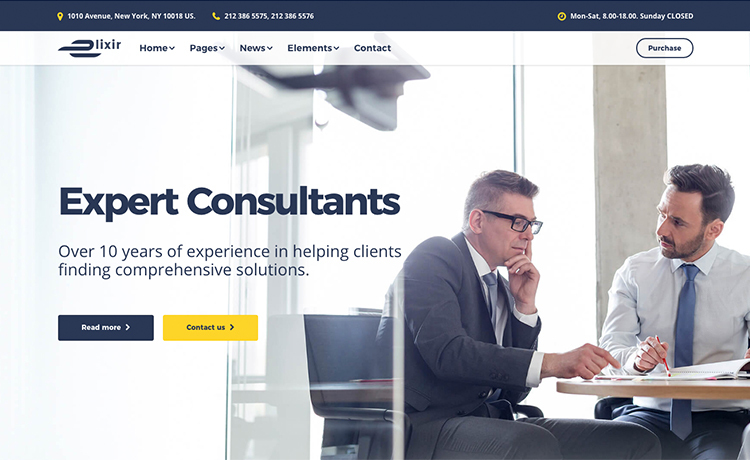 A stunning, responsive HTML5 template for consultancy agency, advisory agency, counselor agency, financial adviser agency, audit firms and other professional organization or businesses who offer a wide variety of services. The template is based on Twitter Bootstrap framework and is perfectly responsive. The template has been designed carefully based on the layout of some real websites. What people need and use already. It also includes some extra features and layout which our design team found necessary for the consultants, advisers, experts, counselor, financial advisers, audit firms, etc. If you think this is not enough and want some more or alternative layout, please comment here. We will update the template and deliver you what you want! Elixir is an elegant bootstrap theme for responsive consultant website. It’s a pixel perfect design matches the current web design standards. It has all the popular web layouts matching with the specific niche of consultation, adviser agency. The color scheme, imagery, typography, spacing, etc. are blended so well. It has even the color scheme of navy blue which represents the corporate, elegance fragrance. If you are trying to build a niche based website and want to focus on content rather than building the site from scratch, Elixir can help you. Editing the template is easy. It has documentation and well-documented code. If you want to organize your contents nicely, the predefined layout will help you. Also, with this Elixir you can design many different kinds of sites. If you know little bit HTML5, CSS you can create and launch your imagination. Elixir is a real elegant HTML5 Bootstrap template for Consultants advisers experts. The template is feature savvy. Few of them are worth mentioning here. There are more than 15 pages and 30+ sections included in this template. Not all are necessary for one, but all of the individual section is necessary for many of you. Still, if you are not satisfied, please comment here. We will design and release a new version and notify you. Elixir is a professional template made by professionals for the professionals. If this template can help you with your business website, we would like to get the feedback from you. If you think this template needs improvement, please comment below and let us know how can we improve things that will help you. I was scrolling and felt WOW!! The animation persuaded me big time to choose the template. This template is real value for money! Get it if you're building your agency website. Got this for our agency site. Even the members of the team liked it very much. Features of the site are pretty organized and functional. It's a complete corporate template. Good guys are here. Help me solving coding problems. We have replied on your email inbox. Please create a support ticket for further assistance. I am impressed with this theme, if I buy this single license, will i get all pages along with the images presented in this Demo, can I use images used in this Demo in my website? You will get all the pages if you buy the single license but not the images used on demo. totally, however this post presents good understanding yet. I want to buy this theme for my office’s website but the view on iphone is not showing is properly as it should. any update on this… it is something you can support to work around it? We have tested it completely on different screen set-ups and there was no trouble. By the way, if you find any problem with a particular device, we will help you fix them. Buy it first and let us know if there’s anything unwanted. Where can er buy the images in the theme, please? If I buy this theme, can I use the images shown in the theme? And I just want to know that, theme is fully customizable or not? Sorry Ajay. The images are for demo purposes only. If you want to use them you have to buy the license. If I buy, can I change colors, change or add css? Beautiful theme, but do I need to change colors to suit my needs? Yes. If you think you need to change colors, of course, you can. The customizing is very easy so you can add or modify CSS. Btw, it’s really a great template especially because of its smooth and beautiful scrolling animation. Can you please send me some info on how to integrate the Contact Forms. If you bought it then please open a ticket. This template design very good. Thank you very much. Happy to know that you love it. Keep visiting us. Cool ..I like the design but its not a mobile compatible , I would appreciate you guys provide me same things which is compatible on ios , android , tablet . Thank you for choosing Elixir. The new v2.0 is available now. It is fully responsive and tested for all popular screen sizes.